Proper eating habits are significant part of living a healthy life and supporting your body. Little changes to your snacking routine, as avoiding snacking mindlessly and filling up on empty calories, can make big strides in your health goals. Yogurt is a rich source of protein, excellent for your digestive health, with probiotics that strengthen your immune system. When you choose yogurt as a snack, you get a big serving of protein, probiotics, vitamins and minerals. Its variety of probiotics is one of the most important advantages of the consumption of yogurt. Probiotics support healthy digestion, battle bad bacteria in your body and fight off infection. Of course, store-bought yogurt is an excellent source of probiotics as well, but homemade yogurt ensures that you are using raw, organic milk and enjoy the greatest concentration of probiotics possible. Research showed that there are numerous good reasons to eat yogurt, including an improvement in gastrointestinal health and a healthier immune system. However, its nutrients are enhanced when you prepare it at home, since you avoid all unnatural preservatives and chemicals. Thus, taking the time to make your own yogurt allows you to enjoy a wide range of health benefits. If you learn how to prepare it, you will be able to have a healthy snack on hand anytime. The preparation of homemade yogurt is so incredibly easy, that there is no reason to buy commercially-made yogurt. In the saucepan, heat the milk, but avoiding scorching. Allow the milk to boil very slightly. Then, pour it into the glass Mason jar and allow it to cool down to 110° (use the thermometer). Next, stir the starter yogurt into the milk and seal the jar. Wrap the jar in the heating pad and then again in the towel. Leave the jar in the turned-on heating pad for 7 to 10 hours. After that time, gently remove the jar from the heating pad and transfer it to the refrigerator and let it sit overnight. The next morning, it will have formed into the ordinary yogurt texture. 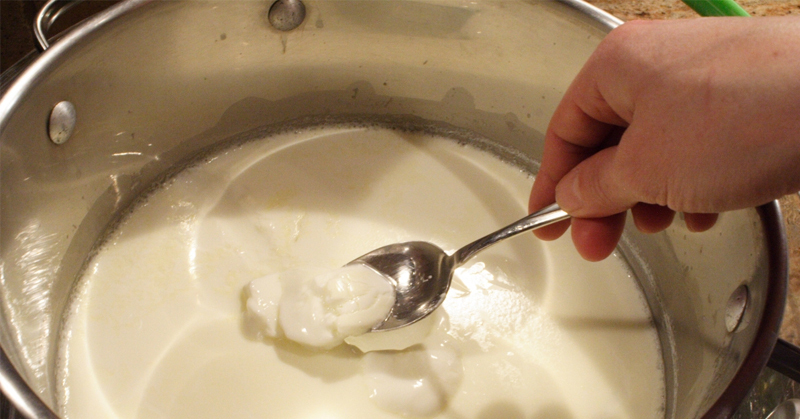 This means that your homemade yogurt is ready for consumption. If you want to give it a little flavor boost, stir in fruit or spices to each individual serving.